The Tampa Bay Lightning unveiled the jersey prior to facing the St. Louis Blues at Amalie Arena on Thursday. 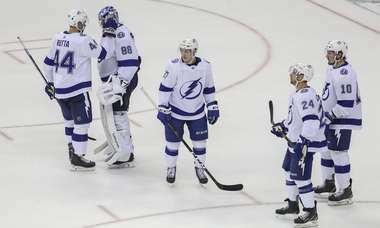 The Bolts were shut out in a 1 to 0 loss in overtime. Lightning center Steven Stamkos sporting the new alternate jersey as he prepare to head from the locker room and onto the ice with his team for warm ups. 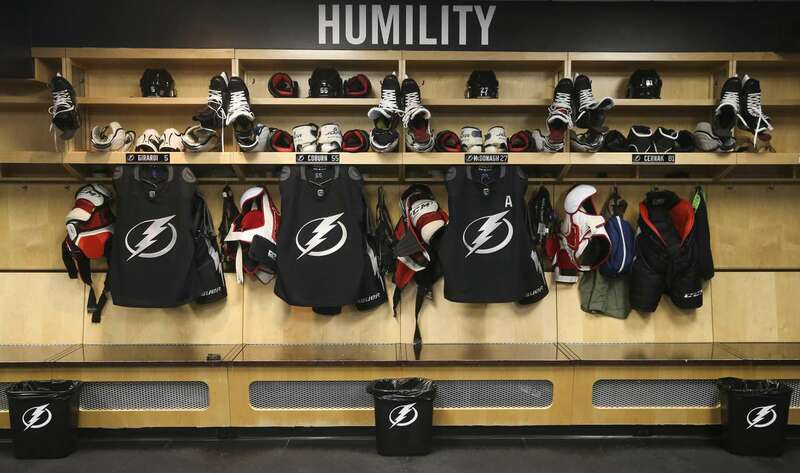 The Tampa Bay Lightning new alternate jerseys hang in the locker room before taking on the St. Louis Blues at Amalie Arena in Tampa, Thursday, Feb. 7, 2019. Lightning defenseman Victor Hedman and left wing Adam Erne sporting the new alternate jerseys as they prepare to head from the locker room and onto the ice for warm ups before taking on the Blues. Lightning right wing Nikita Kucherov gives a hip check to Blues defenseman Jay Bouwmeester along the boards during first period action. Lightning goaltender Andrei Vasilevskiy makes an acrobatic glove save while down on the ice against the Blues during the first period. Lightning defenseman Dan Girardi gets checked after getting rid of the puck against Blues left wing Jaden Schwartz. Lightning goaltender Andrei Vasilevskiy works to make a save during the second period. Lightning goaltender Vasilevskiy during a stoppage in play. Lightning defenseman Victor Hedman leans in before play resumes during the second period. Lightning head coach Jon Cooper on the bench during overtime action. Lightning goaltender Andrei Vasilevskiy gets beat as Blues center Brayden Schenn scores the game winning goal in overtime as the Blue defeat the Lightning with a final score of 1 to 0 during overtime action. Vasilevskiy stopped 38 of 39 shots in the loss as the Bolts were out shot 39 to 32. Blues celebrate their victory with a goal by center Brayden Schenn who scored the game winning goal as the Blue defeat the Lightning with a final score of 1 to 0 during overtime action. Vasilevskiy stopped 38 of 39 shots in the loss as the Bolts were out shot 39 to 32. Lightning goaltender Andrei Vasilevskiy skates off after getting beat by Blues center Brayden Schenn who scored the game winning goal in overtime as the Blue defeat the Lightning with a final score of 1 to 0 during overtime. Lightning goaltender Andrei Vasilevskiy skates off as Blues center Tyler Bozak (21) and right wing Vladimir Tarasenko (91) celebrate their victory as the Blue defeat the Lightning with a final score of 1 to 0 during overtime. Vasilevskiy stopped 38 of 39 shots in the loss as the Bolts were out shot 39 to 32.